Affordable boats are a funny thing. There are many out there that are able to get you into boating at a great price, just as long as you don’t have a big family, too many friends, or have a lot of things. 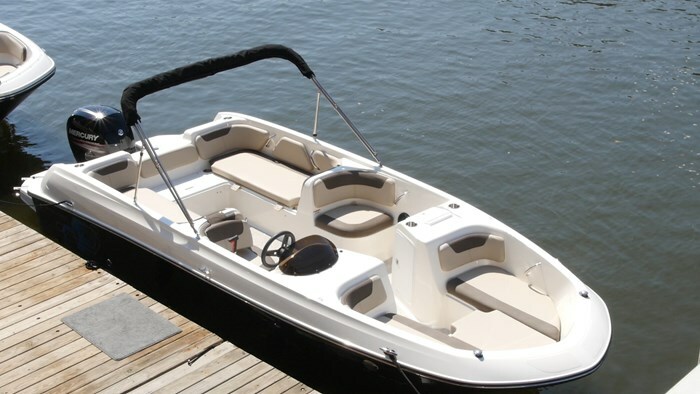 Usually the entry level style boats are around 16-18 feet and don’t give you the most amount of space to work with. You can think of it like buying a compact car, it’s great an economical, but don’t bring a lot of stuff with you. Bayliner is looking to change that in 2017 with the latest expansion to their revolutionary Element line by introducing the largest Element to date, the E21. 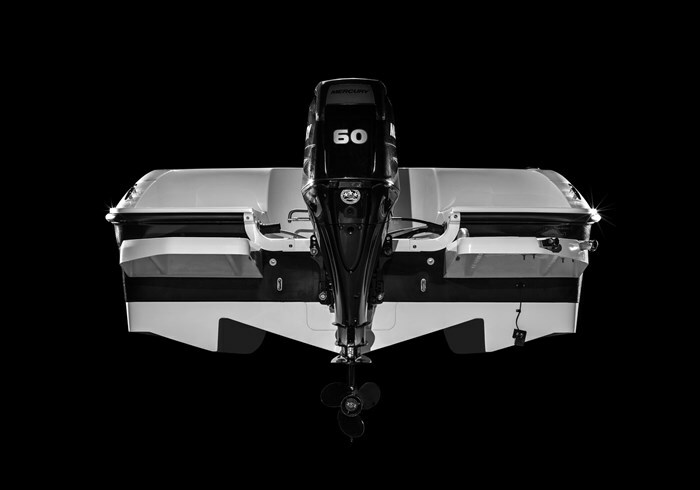 With a length overall of 20-feet 8-inches, this is indeed the largest element to date, and with a person capacity of 10-people, we’re now looking at an affordable, entry level boat that won’t have you confined for space or sitting on each other’s laps. One of the things that impresses me about this boat is that even though it is larger, it stays true to the original Element philosophy and design. It has 3 distinct, conversation areas: the bow, mid ship and a rear lounge. 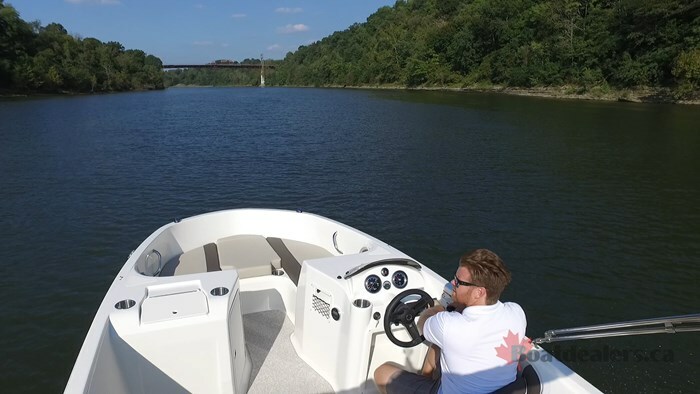 Starting first in the bow, something Bayliner does to create space is to carry the beam as far forward as possible without making it a deckboat. You have probably started to notice that the days of the tapered, pointy bow are gone. This is just a space killer. Now it’s about carrying the beam forward on the boat to maximize the amount of space in one of the most popular spots. In the bow you will find deep storage under the two cushions, drink holders and grab handles. 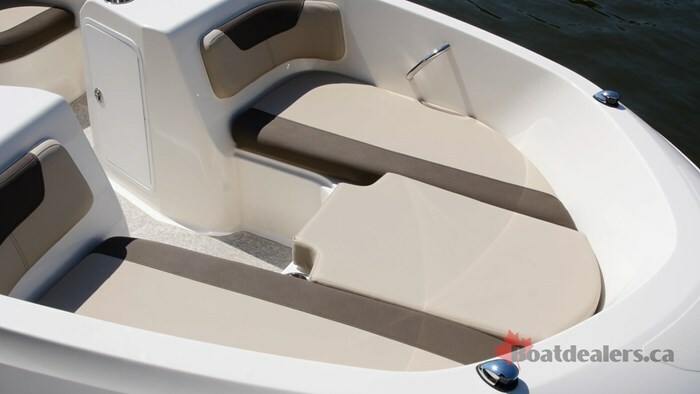 There is a curved, lounge design that’s built right into the deck of the boat that give the bow lounge a very comfortable feel. Moving back to the mid-ship you will find the two pod seats, this being a design taken from the original 16-foot Element. I love that they stuck with this design because you know there would be a temptation to say “what if we just added chairs?” But these pod seats are cost effective, functional and surprisingly comfortable. Their design wraps around you and they lend themselves to a more conversational style as you can move any which way in the seat, still be comfortable and not have to fight with levers and handles. Under the pod seats you will find deep storage as you might assume, with grab handles and speakers close by and forward of the companion seat you will find storage under the console, large enough to stow filler cushions that expand the layout of the E21. What consumers will be most excited to find out is that the E21 will also be available in a full windshield version. 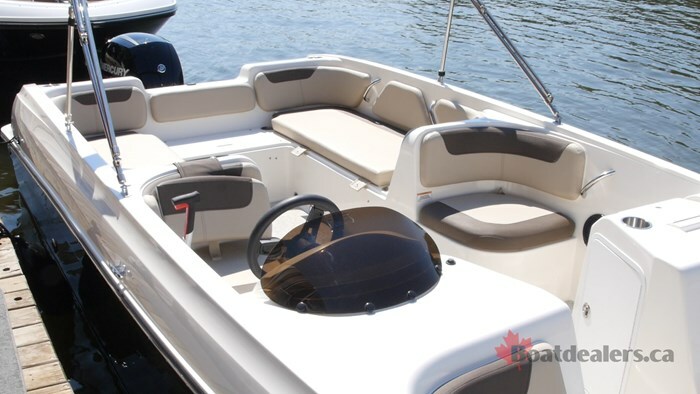 While I am more partial to the side console layout, as I think this is a way to keep the boat open and blend the seating areas together, there are those that simply need a windshield by design, and that will make the E21 perfect for them. Whenever a builder expands on their lines, I always simply ask: “where did you put the extra space?” In the case of the E21 it was added to the loungers in the rear of the boat. Keeping with the theme of simplicity these loungers are bench style, face each other and afford the option to either lounge out facing forward or backwards, enjoying the same amount of comfort. Should there be too many people to kick back with the feet up, they’re comfortable enough that you could easily seat 3 adults on each side. 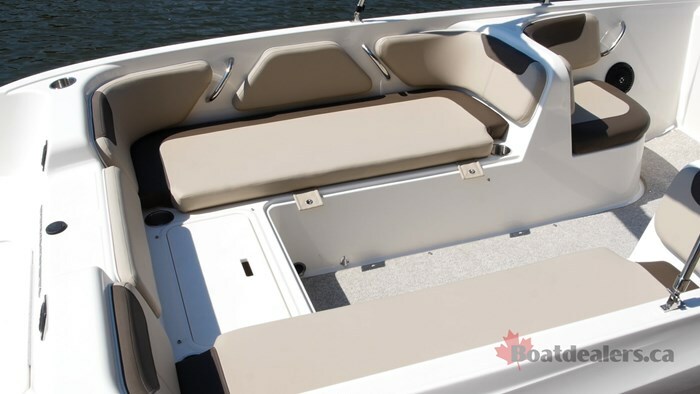 There are two grab handles on each side and perhaps even more exciting is the option to add in filler cushions down the center to make a rear bed. With the fuller cushion in there is easily enough room to lay flat for a little siesta in the sunlight. 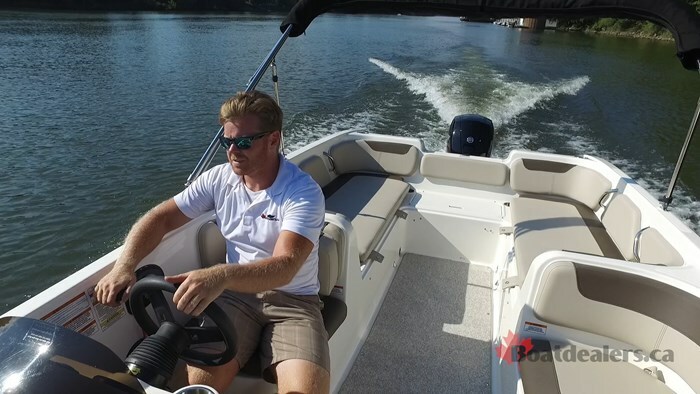 I got to test this E21 at the Bayliner Dealer Meeting held in September in Tennessee and while I was milling around the dock I noticed one of the dealers working intensely in the E21, opening and closing storage and working away. I walked up to him and inquired what he was doing and he said “I want to make sure that there’s actually room to put all of these filler cushions away in the boat. It was such a simple statement but one that’s not always thought of. Sometimes leaving them at the dock, or in the truck is just not a good enough option. If they go in the boat, they should be able to be stowed in the boat. Sure enough when he was done, they were all stowed away. This does take away from storage for some of your gear but not enough to make it a game changer. And should you not opt for the filler cushions, know you will have lots of space for stuff. Rounding out the E21, almost literally are twin stern lounges at the transom. 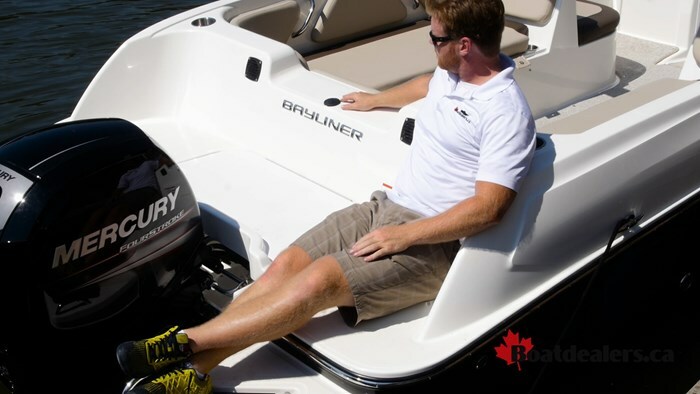 Bayliner designed the stern of the boat to have a rounded design, with a slight slant to it, perfect for kicking back when you’re at the dock or at the sandbar. Your feet extend perfectly onto the extensions and the loungers are also surprisingly comfortable. Looking over the option sheet you can add fishing or watersports features to customize you E21 to the way you boat, but additionally there are 4 gelcoat colour options and 2 upholstery colour options, again reinforcing you can make your E21 your own. 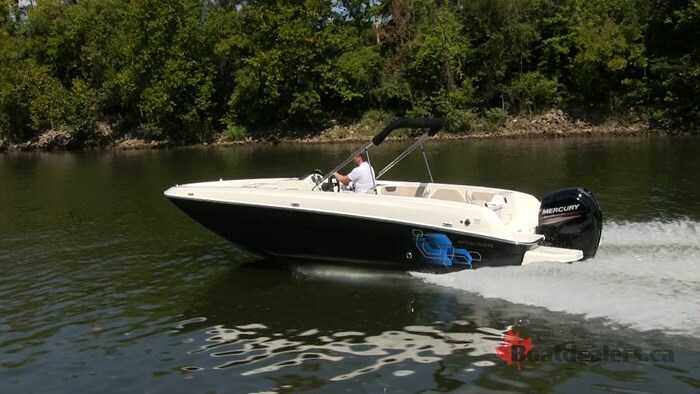 Powering the E21 down in Tennessee was the optional 150-hp Mercury Four Stroke Outboard. 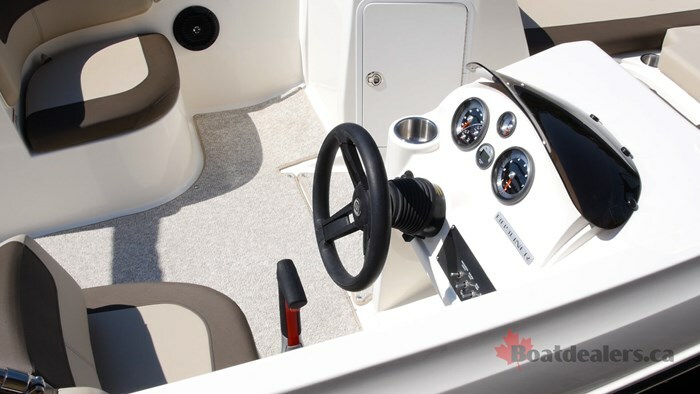 This happens to be the max for this boat, and standard power is the 115-hp Merc. The hull on every Element, including this new E21 is Bayliner’s “M”-Shaped hull. If you’re new to this, they call it that because that’s exactly what the hull looks like. It has modified V bottom with large, aggressive chines on each side to give the look of an M. What these chines do is help the boat get on plane faster, corner better with less bank and give it better stability at rest. All of these things are true and putting the E21 through its paces during our water test proved it even more. The boat was on plane almost instantly, had little to no bank in the turns and handles waves without issue. What further impressed me was the fact that Bayliner has proven that their M-hull design is scalable. 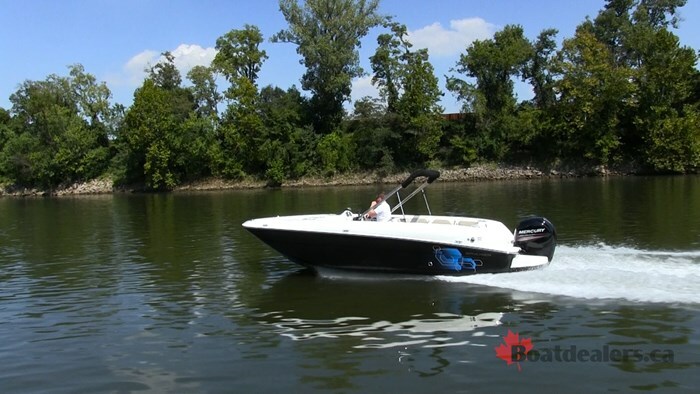 They introduced it as a 16-footer, then an 18 and now a 21-foot hull, which excellent performance and similar running characteristics across all platforms. With 2 on board the E21 cruised well at 3500 rpm hitting a speed of 26.4 mph and the speed jumped up to 31.3 mph by just going another 500 rpm, to 4000. The 150-hp Mercury has always shown impressive mid-range since it’s introduction. With a top speed of 42.9 mph I’m confident that the E21 would be fine, performance wise, with the standard power of 115-hp. I imagine performance numbers on this boat are going to be subjective because of its versatility. What I mean by this is that if you opt for the watersports package you may go with a 4-blade propeller, which will drop some of your top end speed but give you better bite out of the water. Best way is to just get into it yourself and get a feel for it. It’s exciting to see something be introduced in the boating world like the Element back in 2013 and 4 years later have quickly expanded to this. If you ask me I think it has given Bayliner a renaissance, allowing them to reconnect to their brand values of affordable boating. In the end, the more people out on the water, the better!